India's national carrier Air India has launched its first flight linking the Sikh city of Amritsar via Birmingham in the UK to Toronto in Canada. Three flights a week will cater for the growing numbers of Sikhs and Punjabis travelling to their ancestral homes from North America and the UK. The first 10 flights from Raja Sansi airport are sold out, officials say. The service is expected to boost religious tourism around the Sikhs' holiest shrine, the Golden Temple. Sunday's inaugural flight was flagged off by the federal civil aviation minister, Praful Patel, and Punjab's chief minister, Capt Amarinder Singh. The Punjabi community has long demanded a direct air connection between their home state and Western countries where a large number of them are settled. To handle the increased air traffic, the airport at Amritsar is being given a $15m makeover which includes a new terminal building and modern landing aids. 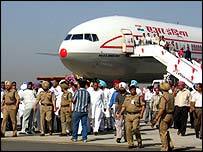 Air India's Regional Director for India, Capt PP Singh, told the BBC that "the response has been huge". As well as the first 10 flights already selling out, "there are heavy bookings for subsequent days". One woman visiting Punjab from her home in New York, Rubina Boparai, said: "All this is most exciting. I am now waiting for the day when I will be able to fly directly to New York from Amritsar and be spared the harassment of a day-long drive to Delhi." Kirpal Singh Duggal, a frequent traveller to the UK, said: "It is like flying directly from one home to another." Mr Patel said the new flight would initiate a phase of growth and prosperity in Punjab. He said the Amritsar-Toronto service would soon be upgraded to a daily one and in the coming months, both Air India and the state's domestic carrier, Indian Airlines, would start other passenger and cargo services from the city. Services will also be extended to include new, budget Air India Express flights from Amritsar to the Gulf countries and other Western destinations.